It has been suggested that this article be merged into Crypto-Judaism. (Discuss) Proposed since May 2018. The origin of the term marrano as applied to Crypto-Jews is debatable, since there are at least three possible etymologies for the word. One source of the term derives from Arabic مُحَرّمٌ muḥarram; meaning "forbidden, anathematized". Marrano in this context means "swine" or "pig", from the ritual prohibition against eating pork, practiced by both Jews and Muslims. However, as applied to crypto-Jews, the term marrano may also derive from the Spanish verb "marrar" (of Germanic rather than Arabic origin) meaning "to deviate" or "to err", in the sense that they deviated from their newly adopted faith by secretly continuing to practice Judaism. A third origin has been cited from Galician-Portuguese, where marrar means "to force" and marrano means "forced one," indicating the compulsory nature of the religious conversions. According to José Meir Estrugo Hazán, in his book: 'Los Sefardíes' -The Sephardim-, ISBN 84-8472-034-9, 'marrano' is the term the Spanish Hebrew prefer to be designed. Under state pressure in the late 14th and early 15th century, over half of Jews in the Iberian Peninsula converted to Christianity, thus avoiding the Decree of Expulsion which affected Spain's remaining openly Jewish population in 1492. The numbers who converted and the effects of various migrations in and out of the area have been the subject of historical debate. A phylogeographic study in 2008 of 1,150 volunteer Y-chromosome DNA haplogroups appeared to support the idea that the number of forced conversions has been significantly underestimated, as 20% of the tested Iberian population had haplogroups consistent with Sephardi ancestry. This percentage was suggested as representing the proportion of Sephardi in the population at the time of mass conversions in the 14th and 15th centuries. However, the authors concede that other historical population movements from the Near East such as Syrians and Phoenicians may also account for these results. Some Portuguese conversos or cristãos-novos continued to practice as crypto-Jews. In the early 20th century, historian Samuel Schwartz wrote about crypto-Jewish communities discovered in northeastern Portugal (namely, Belmonte, Bragança, Miranda, and Chaves). He claimed that members had managed to survive more than four centuries without being fully assimilated into the Old Christian population. The last remaining crypto-Jewish community in Belmonte officially returned to Judaism in the 1970s and opened a synagogue in 1996. In 2003, the American Sephardi Federation founded the Belmonte Project to raise funds to acquire Judaic educational material and services for the Belmonte community, who then numbered 160–180. Two documentary films are known to have been made in north-eastern Portugal where present day descendants of marranos were interviewed about their lives. In 1974 for The Marranos of Portugal, the Israel Broadcasting Authority (IBA) sent reporter Ron Ben-Yishai to carry out interviews with families about their religious practice. After being asked to prove he knew Hebrew before they would talk, he found people still reluctant to talk openly but did eventually gain a remarkable insight into their version of Jewish customs, prayers and songs. The film was commended at the 1976 Jerusalem Jewish Film and TV Festival. Another documentary, The Last Marranos, was made by the New York Jewish Media Fund in 1997. After the expulsion of Jews and Muslims from Spain (1492) and Portugal (1497), conversos continued to be suspect in times of social strain. In Lisbon in 1506, a months-long plague caused people to look for scapegoats. Some became suspicious that conversos might be practicing Judaism and therefore be at fault. 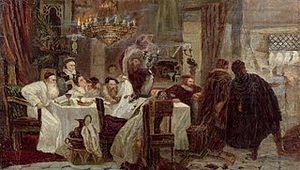 On April 17, 1506, several conversos were discovered who had in their possession "some lambs and poultry prepared according to Jewish custom; also unleavened bread and bitter herbs according to the regulations for the Passover, which festival they celebrated far into the night". Officials seized several, but released them after a few days. On the same day on which the conversos were freed, the Dominicans displayed a crucifix and a reliquary in glass from which a peculiar light issued in a side-chapel of their church, where several New Christians were present. A New Christian who tried to explain the miracle as due to natural causes was dragged from the church and killed by an infuriated woman. A Dominican roused the populace still more. Friar João Mocho and the Aragonese friar Bernardo, crucifix in hand, were said to have gone through the streets of the city, crying "Heresy!" and calling upon the people to destroy the conversos. Attracted by the outcry, sailors from Holland, Zeeland and others from ships in the port of Lisbon, joined the Dominicans and formed a mob with local men to pursue the conversos. The mob dragged converso victims from their houses and killed some. Old Christians who were in any way associated with New Christians were also attacked. The mob attacked the tax-farmer João Rodrigo Mascarenhas, a New Christian; although a wealthy and distinguished man, his work also made him resented by many. They demolished his house. Within 48 hours, many "conversos" were killed; by the third day all who could have escaped, often with the help of other Portuguese. The killing spree lasted from 19 to 21 April, in what came to be known as the Lisbon massacre. King Manuel severely punished those who took part in the killings. The ringleaders and the Dominicans who encouraged the riot were also executed. Local people convicted of murder or pillage suffered corporal punishment and their property was confiscated. The king granted religious freedom for 20 years to all conversos in an attempt at compensation. Lisbon lost Foral privileges. The foreigners who had taken part generally escaped punishment, leaving with their ships. New Christians were attacked in Gouvea, Alentejo, Olivença, Santarém, and other places. In the Azores and the island of Madeira, mobs massacred former Jews. Because of these excesses, the king began to believe that a Portuguese Inquisition might help control such outbreaks. The Portuguese conversos worked to forestall such actions, and spent immense sums to win over the Curia and most influential cardinals. Spanish and Portuguese conversos made financial sacrifices. Alfonso Gutierrez, Garcia Alvarez "el Rico" (the rich), and the Zapatas, conversos from Toledo, offered 80,000 gold crowns to Charles V, Holy Roman Emperor, if he would mitigate the harshness of the Inquisition (Revue des Etudes Juives, xxxvii, p. 270 et seq.). The Mendes of Lisbon and Flanders also tried to help. None were successful in preventing Portugal from introducing the Inquisition in 1478. The conversos suffered immensely both from mob violence and interrogation and testing by the Inquisition. Attacks and murders were recorded at Trancoso, Lamego, Miranda, Viseu, Guarda, and Braga. At Covilhã, there were rumors that the people planned to massacre all the New Christians on one day. In 1562, prelates petitioned the Cortes to require conversos to wear special badges, and to order Jewish descendants to live in ghettos (judiarias) in cities and villages as their ancestors had before the conversions. According to historian Cecil Roth, Spanish political intrigues had earlier promoted the anti-Jewish policies which culminated in 1391, when Regent Queen Leonora of Castile gave the Archdeacon of Écija, Ferrand Martinez, considerable power in her realm. Martinez gave speeches that led to violence against the Jews, and this influence culminated in the sack of the Jewish quarter of Seville on June 4, 1391. Throughout Spain during this year, the cities of Ecija, Carmona, Córdoba, Toledo, Barcelona and many others saw their Jewish quarters destroyed and inhabitants massacred. It is estimated that 200,000 Jews saved their lives by converting to Christianity in the wake of these persecutions. Other Jews left the country altogether and around 100,000 openly practicing Jews remained. In 1449, feelings rose against conversos, breaking out in a riot at Toledo. Instigated by two canons, Juan Alfonso and Pedro Lopez Galvez, the mob plundered and burned the houses of Alonso Cota, a wealthy converso and tax-farmer. They also attacked the residences of wealthy New Christians in the quarter of la Magdelena. Under Juan de la Cibdad, the conversos opposed the mob, but were repulsed. They were executed with their leader. As a result, several prominent converso men were deposed from office, in obedience to a new statute. Nearly 20 years later in July 1467, another riot occurred where a mob attacked conversos in Toledo. The chief magistrate (alcalde mayor) of the city was Alvar Gomez de Cibdad Real, who had been private secretary to King Henry IV of Castile. He was a protector of the conversos. Together with prominent conversos Fernando and Alvaro de la Torre, Alvar wished to take revenge for an insult by the counts de Fuensalida, leaders of the Old Christians. His intention was to seize control of the city, but fierce conflict erupted. Opponents set fire to houses of New Christians near the cathedral. The conflagration spread so rapidly that 1,600 houses were consumed. Both Old Christians and conversos perished. The brothers De la Torre were captured and hanged. 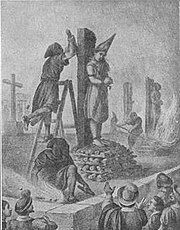 The mob went after conversos, denouncing them as heretics, killing them, and burning their houses. To stop the excesses, the highly respected D. Alonso Fernandez de Aguilar, whose wife was a member of the converso family of Pacheco, together with his brother D. Gonzalo Fernández de Córdoba ("El Gran Capitán"), and a troop of soldiers, hastened to protect the New Christians. D. Alonso called upon the mob to retire. Its leader insulted the count, who immediately felled him with his lance. Aroused, the people considered him a martyr. Incited by Alonso de Aguilar's enemy, they again attacked the conversos. The rioting lasted three days. Those who escaped sought refuge in the castle, where their protectors also took shelter. The government decreed that Jews and Conversos should remain in their neighborhood or leave the city. In 1473, attacks on conversos arose in numerous other cities: Montoro, Bujalance, Adamuz, La Rambla, Santaella, and elsewhere. Mobs attacked conversos in Andújar, Úbeda, Baeza, and Almodóvar del Campo also. In Valladolid, groups looted the belongings of the New Christians. At Segovia, there was a massacre (May 16, 1474). D. Juan Pacheco, a converso, led the attacks. Without the intervention of the alcalde, Andres de Cabrera, all New Christians might have died. At Carmona, it was reported that not one converso was left alive. Execution of Mariana de Carabajal in Mexico, 1601. During 1492, about 12,000 conversos entered Navarre from Aragon's repression, where they were allowed to remain. Tudela in Navarre turned into a converso haven. The Tudelans had already proclaimed in 1486 that "if any inquisitor enters their city, he will be thrown into the Ebro river." Later the resistance to the inquisitors was so strong that its aldermen ordered commissioners and attorneys to ask the Catholic Monarchs to limit the power of the Inquisition in 1510. The conversos of Seville and other cities of Castile, and especially of Aragon, bitterly opposed the Spanish Inquisition established in 1478. They rendered considerable service to the king, and held high legal, financial, and military positions. The government issued an edict directing traditional Jews to live within a ghetto and be separated from conversos. Despite the law, however, the Jews remained in communication with their New Christian brethren. "They sought ways and means to win them from Catholicism and bring them back to Judaism. They instructed the Marranos in the tenets and ceremonies of the Jewish religion; held meetings in which they taught them what they must believe and observe according to the Mosaic law; and enabled them to circumcise themselves and their children. They furnished them with prayer-books; explained the fast-days; read with them the history of their people and their Law; announced to them the coming of the Passover; procured unleavened bread for them for that festival, as well as kosher meat throughout the year; encouraged them to live in conformity with the law of Moses, and persuaded them that there was no law and no truth except the Jewish religion." These were the charges brought by the government of Ferdinand II of Aragon and Isabella I of Castile against the Jews. They constituted the grounds for their expulsion and banishment in 1492, so they could not subvert conversos. Jews who did not want to leave Spain had to accept baptism as a sign of conversion. The historian Henry Kamen's Inquisition and Society in Spain in the sixteenth and seventeenth centuries questions whether there were such strong links between conversos and Jewish communities. Whilst historians such as Yitzhak Baer state, "the conversos and Jews were one people", Kamen claims, "Yet if the conversos were hated by the Christians, the Jews liked them no better." He documented that "Jews testified falsely against them [the conversos] when the Inquisition was finally founded." This issue is being debated by historians. Although the vast majority of Spain's 250,000 conversos abandoned Judaism and simply assimilated into Spain's dominant Catholic culture, many of those continuing to secretly practice their former religion felt threatened and persecuted by the Inquisition which continued to actively persecute heresy. Some of these chose to leave Spain, in bands or as individual refugees. Many migrated to Italy, attracted by the climate, which resembled that of the Iberian Peninsula, and by the kindred language. When they settled at Ferrara, Duke Ercole I d'Este granted them privileges. His son Alfonso confirmed the privileges to twenty-one Spanish conversos: physicians, merchants, and others (ib. xv. 113 et seq.). A thoroughly researched history of these migrations is also contained in the book about one of their leaders called, "The Woman Who Defied Kings", by the historian and journalist Andree Aelion Brooks. Spanish and Portuguese conversos also settled at Florence and contributed to make Livorno a leading seaport. They received privileges at Venice, where they were protected from the persecutions of the Inquisition. At Milan, they materially advanced the interests of the city by their industry and commerce. At Bologna, Pisa, Naples and numerous other Italian cities, they freely exercised the Jewish religion again. They were soon so numerous that Fernando de Goes Loureiro, an abbot from Oporto, filled an entire book with the names of conversos who had drawn large sums from Portugal and had openly avowed Judaism in Italy. In Piedmont, Duke Emmanuel Philibert of Savoy welcomed conversos from Coímbra and granted them commercial and industrial privileges, as well as the free exercise of their religion. Rome was full of conversos. Pope Paul III received them at Ancona for commercial reasons. He granted complete liberty "to all persons from Portugal and Algarve, even if belonging to the class of New Christians." By 1553, three thousand Portuguese Jews and conversos were living at Ancona. Two years later, Pope Paul IV issued orders to have all the conversos in Italy be thrown into the prisons of the Inquisition which he had instituted. Sixty of them, who acknowledged the Catholic faith as penitents, were transported to the island of Malta; twenty-four, who adhered to Judaism, were publicly burned (May 1556). Those who escaped the Inquisition were received at Pesaro by Guidobaldo II della Rovere, Duke of Urbino. Guidobaldo had hoped to have the Jews and conversos of Turkey select Pesaro as a commercial center; when that did not happen, he expelled the New Christians from Pesaro and other districts in 1558 (ib. xvi. 61 et seq.). Many conversos also went to Dubrovnik, formerly a considerable Croatian seaport on the Adriatic Sea. In May 1544, a ship landed there filled with Portuguese refugees. During the 16th and 17th centuries, some conversos migrated to the Americas, often the Castilian territories of the Viceroyalties of New Spain (North and Central America) and Peru (South America and Colombia). Legal emigration to the New World was strictly controlled and required proof of three generations of Christian ascendance. Nevertheless, many Conversos managed to evade these restrictions and managed to obtain encomiendas in the New World. According to Isidore Loeb, in a special study of the subject in the Revue des Études Juives (xiv. 162–183), about 3,000 Jews came to Provence after the Alhambra Decree expelled Jews from Spain in 1492. From 1484, one town after another had called for expulsion, but the calls were rejected by Charles VIII. However, Louis XII, in one of his first acts as king in 1498, issued a general expulsion order of the Jews of Provence. Though not enforced at the time, the order was renewed in 1500 and again in 1501. On this occasion, it was definitively implemented. The Jews of Provence were given the option of conversion to Christianity and a number chose that option. However, after a short while – if only to compensate partially for the loss of revenues caused by the departure of the Jews – the king imposed a special tax, referred to as "the tax of the neophytes." These converts and their descendants soon became the objects of social discrimination and slanders. There was no significant wave of emigration of conversos from Spain, the majority of Sephardic communities, such as that of Salonika having been formed as a result of the Alhambra Decree in 1492. However, there was a steady trickle of crypto-Jewish marranos who wished to practice their faith freely to more liberal environments. One of their leaders who helped them get there was the Lisbon-born international banker, Gracia Mendes Nasi. They also migrated to Flanders, where they were attracted by its flourishing cities, such as Antwerp and Brussels. Conversos from Flanders, and others direct from the Iberian Peninsula, went under the guise of Catholics to Hamburg and Altona about 1580, where they established a community and held commercial relations with their former homes. Some migrated as far as Scotland. Christian IV of Denmark invited some New Christian families to settle at Glückstadt about 1626, granting certain privileges to them and to conversos who came to Emden about 1649. The vast majority of Spain's conversos, however, remained in Spain and Portugal and were suspected of "Marranism" by the Spanish Inquisition. Although the wealthier among them could easily bypass discriminatory Limpieza de sangre laws, they constituted a significant portion of the over three thousand people executed for heresy by the Spanish Inquisition. The New Christians of Portugal breathed more freely when Philip III of Spain came to the throne. By the law of April 4, 1601, he granted them the privilege of unrestricted sale of their real estate as well as free departure from the country for themselves, their families, and their property. Many, availing themselves of this permission, followed their coreligionists to North Africa and Turkey. After a few years, however, the privilege was revoked, and the Inquisition resumed its activity. Some migrated to London, whence their families spread to Brazil (where conversos had settled at an early date) and other colonies in the Americas. Migrations to Constantinople and Thessaloniki, where Jewish refugees had settled after the expulsion from Spain, as well as to Italy, Serbia, Romania, Bulgaria, Vienna, and Timișoara, continued into the middle of the 18th century. Late 20th century political and social changes in Spain caused reappraisal of Jewish and Muslim contributions to its culture. There has been much new scholarship on Sephardic Jews, Moors and the consequences of conversion and expulsion. In addition, there have been official governmental efforts to welcome tourists of both ancestries to Spain. Towns and regions have worked to preserve elements of Jewish and Moorish pasts. By Spanish Civil Code Art. 22.1, the government created concessions for gaining citizenship to nationals of several countries and Sephardi Jews historically linked with Spain, allowing them to seek citizenship after five years rather than the customary ten required for residence in Spain. Later it was dropped to two years. In November 2012, the residency requirement was eliminated completely. In October 2006, the Parliament of Andalusia asked the three parliamentary groups that form the majority to support an amendment that would similarly ease the way for nationals of Morisco descent to gain Spanish citizenship. The proposal was originally made by IULV-CA, the Andalusian branch of the United Left. In 2004, Shlomo Moshe Amar traveled to Portugal to celebrate the centennial anniversary of the Lisbon synagogue Shaare Tikvah. During his stay, Shlomo Moshe Amar met descendants of Jewish families persecuted by the Inquisition who still practice Judaism (Bnei Anusim) at the house of rabbi Boaz Pash. This was an historical meeting that had not happened between a Chief Rabbi and Portuguese marranos (Bnei Anusim) in centuries. Rabbi Shlomo Moshe Amar promised to create a committee to evaluate the Halachic situation of the community. The delay of the Chief Rabbi to create the committee and help the descendents of Sephardi Jews in Portugal forced the creation of a second Jewish community in Lisbon, Comunidade Judaica Masorti Beit Israel, to ensure the recognition of the Bnei Anussim as Jews. Cohen, Martin A. "Toward a New Comprehension of the Marranos." In Hispania Judaica: Studies on the History, Language, and Literature of the Jews in the Hispanic World. Vol. I: History, edited by Josep M. Solà-Solé, Samuel G. Armistead, and Joseph H. Silverman, 23–35. Barcelona: Puvil-Editor, 1980. Escobar Quevedo, Ricardo. Inquisición y judaizantes en América española (siglos XVI-XVII). Bogota: Editorial Universidad de Rosario, 2008. Netanyahu, Benzion. The Marranos of Spain: From the Late 14th to the Early 16th Century, According to Contemporary Hebrew Sources , 3rd ed. Ithaca: Cornell University Press, 1999. Poliakov, Leon. The History of Anti-Semitism, vol. 2: From Mohammed to the Marranos. Philadelphia: University of Pennsylvania Press, 2003. Révah, I.S. "Les marranes." Revue des études juives 118 (1959–60): 29–77. Rowland, Robert. "New Christian, Marrano, Jew." In The Jews and the Expansion of Europe to the West, 1450–1800, edited by Paolo Bernardini and Norman Fiering, 125–148. New York: Berghahn Books, 2001. Saraiva, António José. The Marrano Factory: The Portuguese Inquisition and Its New Christians, 1536–1765 , trans. H.P. Salomon and I.S.D. Sassoon. Leiden: Brill, 2001. Simms, Norman. Masks in the Mirror: Marranism in the Jewish Experience. New York: Peter Lang, 2006. Wachtel, Nathan. The Faith of Remembrance: Marrano Labyrinths , trans. Nikki Halpern. Philadelphia: University of Pennsylvania Press, 2013. Yerushalmi, Yosef Hayim. From Spanish Court to Italian Ghetto. Isaac Cardoso: A Study in Seventeenth-Century Marranism and Jewish Apologetics. New York: Columbia University Press, 1971. Yovel, Yirmiyahu. The Other Within: The Marranos: Split Identity and Emerging Modernity. Princeton: Princeton University Press, 2009. Yovel, Yirmiyahu. Spinoza and Other Heretics, vol. 1: The Marrano of Reason. Princeton: Princeton University Press, 1989. ^ Adams, Susan M.; Bosch, Elena; Balaresque, Patricia L.; et al. (2008), "The Genetic Legacy of Religious Diversity and Intolerance: Paternal Lineages of Christians, Jews, and Muslims in the Iberian Peninsula", American Journal of Human Genetics, 83 (6): 725–736, doi:10.1016/j.ajhg.2008.11.007, PMC 2668061, PMID 19061982 . ^ Adams, Bosch, et al. (2008): "Despite alternative possible sources for lineages ascribed a Sephardic Jewish origin, these proportions attest to a high level of religious conversion"
^ "La cifra de los sefardíes puede estar sobreestimada, ya que en estos genes hay mucha diversidad y quizá absorbieron otros genes de Oriente Medio" ("The Sephardic result may be overestimated, since there is much diversity in those genes and maybe absorbed other genes from the Middle East"). ¿Pone en duda Calafell la validez de los tests de ancestros? "Están bien para los americanos, nosotros ya sabemos de dónde venimos" (Does Calafell doubt the validity of ancestry tests? "They can be good for the Americans, we already know from where we come from.") "Tres culturas en el ADN". Público.es. Archived from the original on 2009-02-09. Retrieved 2009-04-13. ^ Saey, Tina Hesman (4 December 2008). "Spanish Inquisition couldn't quash Moorish, Jewish genes". Science News : "We think it might be an overestimate" "The genetic makeup of Sephardic Jews is probably common to other Middle Eastern populations, such as the Phoenicians, that also settled the Iberian Peninsula, Calafell says. "In our study, that would have all fallen under the Jewish label." ^ Callaway, Ewen (December 4, 2008), "Spanish Inquisition left genetic legacy in Iberia", New Scientist . ^ Zalloua, Pierre A.; Platt, Daniel E.; El Sibai, Mirvat; et al. (2008), "Identifying Genetic Traces of Historical Expansions: Phoenician Footprints in the Mediterranean", American Journal of Human Genetics, 83 (5): 633–642, doi:10.1016/j.ajhg.2008.10.012, PMC 2668035, PMID 18976729 . ^ Gedaliah b. Jachia the Spaniard, Sefer Shalshelet HaKabbalah, p. 268, Jerusalem 1962, while citing Sefer HaYuchasin. ^ Cf. Salcedo Izu, Joaquín, Gran Enciclopedia Navarra, Caja de Ahorros de Navarra, Pamplona 1990, Tomo VI, voz Inquisición, pp. 131–134. ^ Michael Servetus Research Website with historical and graphical study on the conversos in Navarre, specifically the converso Michael de Villanueva ("Servetus"). ^ a b c Kamen, Henry (1985), Inquisition and Society in Spain in the sixteenth and seventeenth centuries, Bloomington: Indiana University Press, p. 27, ISBN 0-253-22775-5 . Roth, Cecil; Roth, Irene (1974), A history of the Marranos (4th ed. ), New York: Sepher-Hermon Press, ISBN 0-87203-040-7 . Diesendruck, Arnold (2002), Os Marranos em Portugal, São Paulo: Editora & Livraria Sêfer, ISBN 85-85583-36-3 . Trial of Gabriel de Granada by the Inquisition in Mexico, 1642–1645. According to Cecil Roth, "it gives a remarkably graphic impression of a typical Inquisitional case"